Did "Tranching" of Investments by VCs lead to the Undoing of Stayzilla? In a LinkedIN post titled "What We MUST learn from the #Stayzilla Incident. But are we? 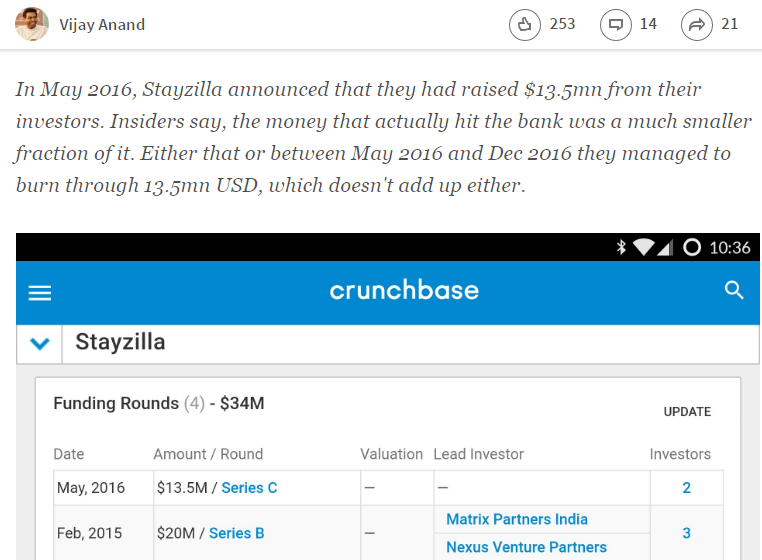 ", Vijay Anand, Founder of Chennai-based accelerator The Startup Centre, suspected that VC investors in the company might not have transferred the entire funding amount as available in public sources like TechCrunch, etc. Venture Intelligence Research Head Vinoth jumped into action to pull out regulatory filings based information from the Venture Intelligence PE/VC Deals Database. And advised Vijay Anand that the investors had indeed paid up the committed capital of $13.5 M (INR 87.77 Cr to be specific) in full. Here's an extract from Stayzilla's FY16 annual report acknowledging the receipt of the investor's committed capital. While tranching of funding has caused problems at other startups, it does not seem to have been the villain in the case of Stayzilla. In all cases though, think of Venture Intelligence whenever you need validated information on Private Company Financials, Transactions & their Valuations - based on actual filings. This kind of validated stuff is simply not available in any other database. Free or Paid. Foreign or Indian.